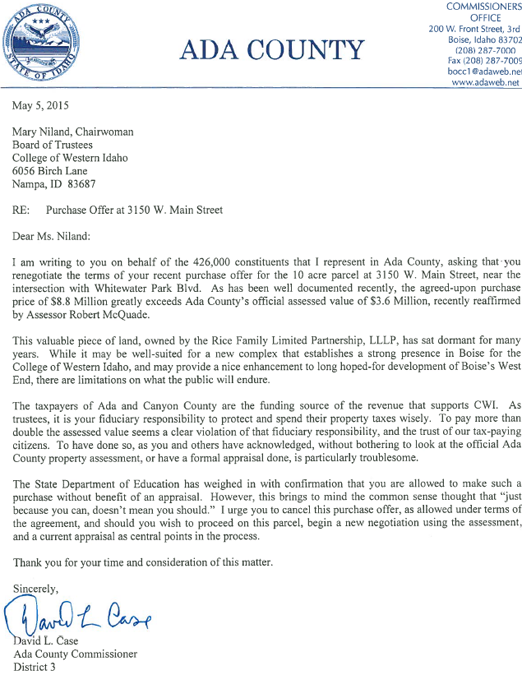 Ada County Commissioner Dave Case has sent a letter to Mary Niland, president of the College of Western Idaho Board of Trustees, asking the board to reconsider its land purchase. Like other GUARDIAN readers, the Commish asks the board to use its “escape clause” and cancel the sale. I agree with Case on this one. This is ridiculous! There are several “outs” to the purchase agreement during the due diligence period. CWI has already admitted the mistake. It’s time to act on it. Cancel the agreement! It’s that simple!!!!!!!! Alumni, students, tax payers should all be outraged and you can bet that future “donations” will be impacted. Good job Dave! Lets see if our mayor will step up to the plate and do the same. How can we recall or remove the CWI chairman and trustees from office? I would like to start a petition to do so if the chairman does not resign by Friday. His comments today were arrogant and showed that he lacks the basic common sense to be involved with CWI in any way – and this deal proves it. EDITOR NOTE–Mary, you may have seen the President on Channel 6. The chairperson is Mary Niland, the elected trustee. I am wondering about something which may or may not have do do with this 10 acre parcel of land. In the Daily there was a news item about the discovery of “unexpected” industrial waste in the area where work on the new park is being developed. Does that mean that the CWI 10 acres is also likely to cover such waste, or, are the two areas close enough for this to be an issue? I’m unclear as to the proximity of these areas. David Case was a careful steward of taxpayer dollars when he served as a Kuna School District Trustee. He is doing the same in his service as Ada County Commissioner. I thank him for voicing his concern in this very questionable expenditure of taxpayer dollars. Absolutely agree with Commissioner Case. This is a bad deal and a misuse of tax dollars. The CWI board should void the agreement and then resign. Now the dead tree idaho daily mistaken is saying CWI will seek an appraisal. And it all started with the Guardian. Thanks Dave. You are the only real reporting tool we have anymore. Grumpy; The contamination at Esther Simplot Park is nearly a half mile north and downstream from the CWI/old Ford dealership site. The historical uses of the 2 sites are quite different as well. Between the 2 sites is the 30′ deep abandoned gravel pit pond now known as Quinn’s Pond aka Clocktower Pond aka Bob Rice Pond if you’re really an old timer. I’ve been there many times and have never seen an oil sheen on it. It’s unlikely the contamination found at ES Park would show up at the CWI site. That’s not to say the CWI site does NOT have some sort of contamination. It probably does, which opens up another angle which hasn’t been covered. That is— what if the CWI site turns out to have a brownfield? Who’s paying for remediation? How much will it cost? Shouldn’t a brownfield assessment be done before any purchase agreement? Again, dear CWI leaders. It’s well known the 30th St area is peppered with brownfields. And furthermore, there are probably flood plain issues. Has anyone looked into this? ES Park planning phase had an issue with the flood plain map which was determined to be in error and needed to be redrawn and then approved by agencies like FEMA and/or USACE. A few years back, I think there was a brownfield assessment for the area, maybe I’ll look for it later. I think it was even a Statesman story. The issue is also addressed in the 30th St Master Plan and urban renewal reports, iirc. Thank you Dave Case for standing up for the tax payers. If CWI did not get an appraisal, did they also not get a level 1 environmental report? Could the tax payers be acquiring an environmental problem? Since CWI did not do the most basic of due diligence with an appraisal, I am wondering what other best practices of commercial property acquisition they also omitted. I was also concerned about the CWI president’s comments. I am not sure he understands the gravity of this error he and his staff have made, the loss of trust and goodwill, and his comments how important of a property this is does not bridge the value gap nor push aside fiduciary responsibility of our tax dollars. My reading of the contract between CWI/Rice is that if environmental issues are not found before closing of the contract it is buyer beware. It would be impossible to have an accurate assessment in this short of a period. $ 8 million invested in buildings on the Nampa campus would eliminate some of the leases they currently are paying $2 million/year including some in Canyon county. Is it good business to buy more land when what you need is classroom space? CWI says they have the $8 million squirreled away. Why not use it now and remain debt free? I like how the letter twice lists the address and describes the location. …as if maybe there might be some confusion as to which deal the letter is in regards to. I don’t comprehend the huge amounts of money being thrown around for what amounts to, in most cases, a place to earn a very expensive certificate or GED. The dictionary defines “college” primarily as an institution of higher learning. Is CWI this in name only? Is a GED really higher learning? Per its own website, CWI has had 5 “completion” ceremonies since inception (2014 being the last). In most years where there is a breakout provided, more GEDs are awarded than certificates or AA degrees. One exception on the website says that 2014, 889 total AA, AS, AAS were earned. Government site (FAFSA) says there is only 10% graduation rate at this entity, a 50% retention rate, and only 14% transfer rate (Federal School data summary – school code 042118). Some in Idaho are quick to put down other similar institutions, like Stevens Henager, as being expensive or rip-offs, yet even that institution shows 75% graduation rate, and 62% retention on same government site (this is higher than BSU!). Why are we making our citizens go into debt for what is, in the best cases, completion of high school level knowledge via GED, or specific-skill certificates that aren’t transferable to a 4-year college? Shouldn’t there be better-value opportunities to earn those things? Internships? On-the-job learning? Someone commented that CWI Alumni should be outraged. How many alumni are in a position to be affected directly by tax hikes/bond purchases, who would indeed be outraged? If someone who has had an actual positive experience/improved (proven) employability, or other information they can share on a personal level due to their time at CWI, please do share! I am not otherwise convinced the potential cost to the taxpayers is justified. The admission that due diligence regarding value was the first casualty in this offer of purchase does not bode well for secondary considerations of environmental hazards which commercial properties like this one could contain. The cost of cleaning up the Winco site by the courthouse was a cool million-plus 15 years ago. EPA/DEQ rules have changed since then. TPH (total percent of hydrocarbon) was replaced with “Risk based assessment” and it is far more stringent and costly to remediate any hazmat issues. This was an automotively oriented property for years. If contamination does exist currently, the issues surrounding them could easily tie up any development of this property for years, with millions of CWI dollars in limbo until all interested parties are satisfied with remediation etc. From this standpoint alone, this property should not be considered for purchase. Testing can only reveal so much. It would be tragic to literally “un-earth” long forgotten hazmat issues from under the covering of asphalt at this site. Hazmat issues which were non-issues back in the last 1960’s would most likely not be given a pass from DEQ/EPA. CWI! Exercise your right to withdraw from this purchase immediately. The risks are simply too great regardless of price! Just saw (vedio clip) the CWI President double down on the wasted $5M. This transaction was no error. CWI has only been around a few years and has already demonstrated significant irresponsibility with it’s tax-grab money. Holding themselves out as champion of the underdog while wasting tens of millions on stuff they don’t need. How do we take back the original bond issue since they apparently have money to burn… and proudly do so right under the nose of the people they stole it from. JJ – you got my point – neither the President or the Board get it. They think it is ok – no harm no foul. Both need to go! Cynic, thanks for providing answers to my questions, very helpful to my understanding. Everyone, thanks for thoughtful issues raised and discussed. Nice to see so many staying on topic. Guardian, thanks again for both raising relevant local topics, and for providing a forum for the discussion thereof. After catching up reading all of the posts re this CWI fiasco, I am reminded of just how easy inflation creeps into our economy at so many junctures. I was just a kid in the late 60s, and $1 bought about $10 worth of goods in 2015 terms. I could walk over with a quarter to the Hollywood Market on 8th St (when the Coontz’s owned it-nice people) and brought home a lunch. CWI just goes out and is ready to plunk down 5 mil over what a property costs and if they were to pull it off, that overage will get passed on to the rest of us, without a doubt. And that my friends counts as punishing inflation. Thank you Guardian for spotting this mess.